Cut these wires about 11/2" away from connector. To be safe I removed the center red wire since it wont be used. It will come out by giving it a good yank on the red wire. Take the ground wire the kit came with and put the gold terminal onto the end after stripping the wire. Slide the rubber part back onto the wire away from the end. I used some pliers to crimp the terminal onto the wire. You can either keep it this way or solder it. I highly recommend soldering all the connections. Then after it cools off slid the rubber insulator back to cover the solder connection. Do the same thing to the power wire. The shorter end from the fuse which will connect to the battery. Next you will have to find a good ground. I used the bolt which holds down the seat backrest. You will have to sand the paint away to get a good connection. Solder all connections and tape them all. Tape the edge of the opening to prevent the wires from shorting out on the body as seen in picture. 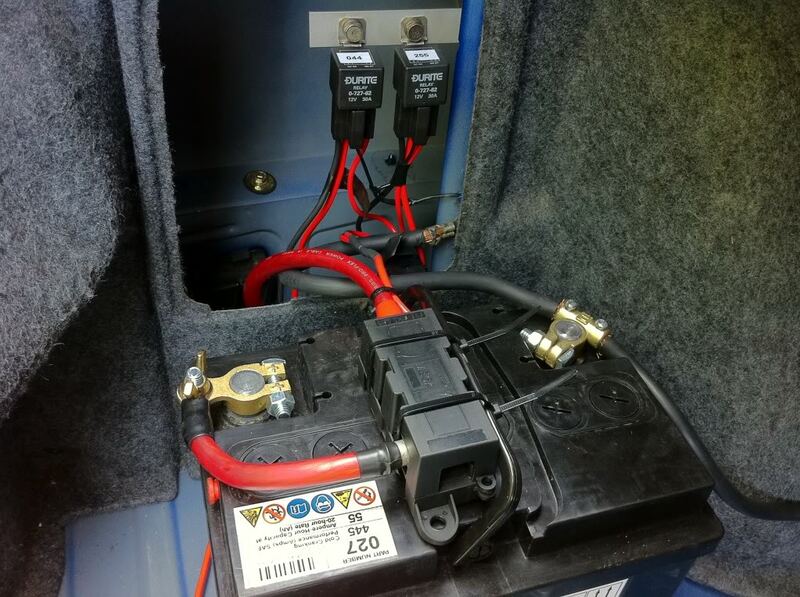 Tuck the wires in neatly and plug in your fuel pump. All these wires need to come into the car along with the relay. To make sure the wires are not being smashed you will have to bend the cover plate to allow the wires to come through. Tape the relay down as shown in the picture. You will have to run your power wire up to your battery. Pull the fuse before attatching the power wire to the battery. Reinstall your seat and put your fuse in. Car should start right up. Depending on what kind of pump you have you may need and aftermarket fuel pressure regulator. I have a DW300 pump and its overrunning my stock regulator. Base pressure is about [email protected] Mine jumped up to about [email protected] This is with E85. Might jump up more on pump gas. Hopefully this helps some people out. If you have any questions or if I missed something just let me know. Last edited by wizzo 8; Mar 1, 2012 at 08:33 PM. Thanks for the post! i was just about to do this on saturday. You beat me to it. Well done! I was waiting for someone to do this writeup. Great work and excellent write up! Thank you! Are you still running out of fuel with your DW pump after the rewire? On E70 yes. I was able to go from 27lbs of boost to 30 after rewire. I did hit 32lbs but it was way too lean. Im going to try the walbro 400lph next but I know in the long run I will need a DP. Yes!!! thanks wizzo 8, I was hoping someone made a how to for this proceedure. Pics make the instructions a 100X easier to follow. Thanks again. Hey Wizzo what size injectors are you running? What lbs/min you hitting? I could go as far as 34 psi on my hta green on e85 and was still fine. Are you on the fp black?